Got everything done on it several months ago and have been to the track and the dyno since. There were a few minor things that have been fixed and hopefully he'll be faster than he was before. First night at the track was the love / hate relationship we share with hot rods. Off the trailer he ran a motor pass which he rarely does. It went mid 6.80's (can't remember exactly) but it was 0.08 faster than it had ever gone on motor in the past. Weather wasn't the greatest so we were looking good. When he put the nitrous bottle in the line fitting cracked and started leaking - CRAP! I could tell the whole story about what we tried to do to get a line to work but it's a long story. Basically he went home without spraying it. Second time we went to the track much better but still where we should have been. Car went mid 6.30's with mid to high 1.30 60's. It has been in the 20's. It's a flat top setup with Victor Jr. heads - should be around a 10 - 1 setup. He runs either 110 or 112 octane fuel with only a 180 shot. We had timing set at 36* pulling 9* (27* total) for nitrous. I thought he had too much octane so I bumped it up 2*. Everything fell off - mph, e.t. and 60' so definately the wrong direction. Backed it down to 24* total and it picked up very slightly but not much but we left it there. It had a stumble that I guessed was the hobb switch as I try to set them close (evidently too close) to flowing pressure. I've seen this before when the system is activated and the regulator takes a split second to respond. Backed it off slightly and the stumble went away but it wasn't any faster. It would pull the tires but nowhere like I have seen it in the past. Not a bad night but still lacking. Nice running combo is it a stroked windsor? 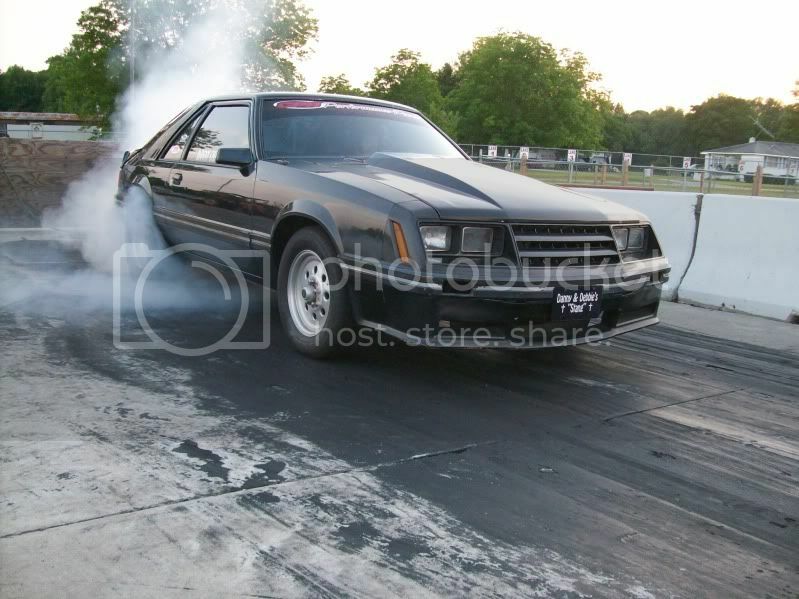 We have one that is very similar 357ci Victor jr head, victor jr intake, flat tops, Howard H beams, Howards hdy roller,4340 crank, Glide with 3500 stall nitrous converter, 4.56 gear, 315/60 drag radial with a race weight of 2845. The best so far is 6.83 at 100 and a 6.05 on a 225 shot and C-16. Most of the time its takes most combos to be 393ci to run that fast. People never believe us when we tell them its a 357 with out of the box heads and intake. Most of the stuff was bought used and I never expected it to run that good. Here's a better picture in the daytime. Thats definatley a nice setup?